The Kiwanians of the District of Eastern Canada and the Caribbean recently honored Katrin Casserly, chair of Hanover Charities, as their 2018 Citizen of the Year. 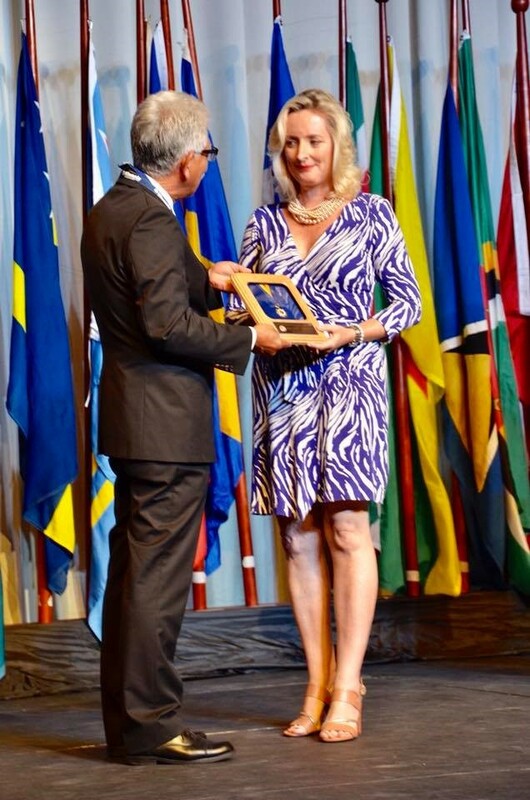 Citing her 15 years as the “driving force behind Hanover Charities,” Robert Moo Young, the Governor of Kiwanis Eastern Canada & the Caribbean bestowed this high honor on our chairperson during the Kiwanis annual convention in Montego Bay this year. Governor Bobby went on to say that Katrin’s “deep and abiding interest in meaningful social causes” has been manifested in her work. Under her guidance, Hanover Charities’ fundraising has flourished and allowed the charity to extend the number of scholarships it gives. Further, Hanover Charities has built computer labs in local schools, advancing the learning for hundreds of students and teachers. In the wider community, Governor Bobby added, thousands of parishioners are benefitting from Katrin’s leadership in rebuilding the Orchard Sports Complex in Hopewell through a collaboration with the Tryall Fund, Hopewell Jaycees, and the Lennox Lewis Foundation.